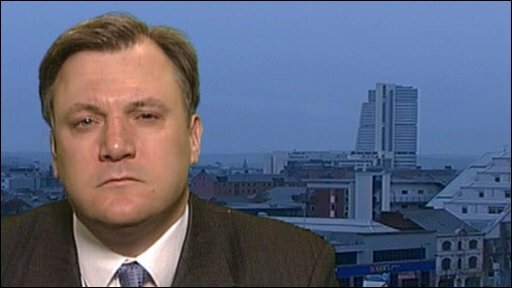 Children's Secretary Ed Balls has challenged the Conservatives to match his promise of protecting school budgets from public spending cuts. 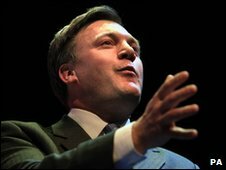 In a speech to a teachers' conference, Mr Balls committed Labour to increasing spending on pupils until 2013. But he claimed Tory plans for schools did not add up without "massive cuts or an increase in VAT". A Conservative spokesman rejected this, saying their policies "prioritised front-line spending on schools". Mr Balls told the NASUWT teachers' union in Birmingham that the key issue for education in the election would be choices over school funding. 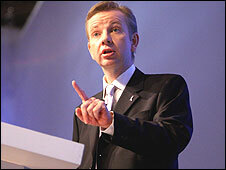 He accused the Conservatives of prioritising a National Insurance freeze over public services. And he claimed the Tories had a "policy of concealment" over their spending intentions on schools - saying their "sums don't add up". The Conservatives want to provide more funding to support disadvantaged pupils - and have announced plans to fund an extra 200,000 places in schools which will be run by parents or other providers. Mr Balls said such plans were unaffordable without cutting budgets elsewhere. "We need to know why there is no promise to protect school budgets," he said. Setting out Labour's plans, he guaranteed to protect school spending - with an annual rise in real terms of 0.7%. This will be offset by £1.1bn of cuts in education areas away from the front line. He received a standing ovation - unusual for a minister at a teachers' conference - as he outlined the increased investments in education since 1997. The Conservatives denied any suggestion of funding gaps in their policy for schools. Freezing a planned National Insurance rise would mean saving £66m from the education budget, said a Conservative spokesman. And he said the "free schools" policy, funding parents to set up schools, would use existing budgets for building new schools - and that there would be "no extra revenue spending". Conservative schools spokesman Michael Gove also accused the Department of Children, Schools and Families of wasting public money - including renovations to the department's headquarters which he said included a "massage room and a contemplation suite". David Laws, schools spokesman for the Liberal Democrats, had told the conference on Sunday that his party's plan for a "pupil premium" - targeting cash at disadvantaged pupils - was the only proposal that would guarantee extra funds for schools. Mr Laws claimed the Conservative pupil premium policy would depend on taking money from other school budgets, while the Labour pupil premium announcement was a "repackaging exercise" using existing funding.